Water damage restoration in Stafford can help you deal with flooding caused by heavy rains, blizzards, ice dams, or plumbing disasters. 911 Restoration of Northern Virginia can begin flood cleanup now and our services include mold inspections after you experience water damage. Let us check for fungal growth and begin mold removal if you have an infestation. You can call us now to ensure your property is returned to better-than-new condition with water damage cleanup, mold decontamination, and mold remediation in Stafford. How Soon Can You Get Water Damage Restoration in Stafford? Pipe bursts and floods cause increasing amounts of damage if they are left untreated. That’s why 911 Restoration of Northern Virginia offers same-day water damage restoration in Stafford. You can contact us as soon as you discover you’re dealing with a flooded basement, leaking ceiling, or backed up toilet. Mold remediation in Stafford is often an important part of flood cleanup. Our mold removal crews are licensed, certified, and insured to take care of mold decontamination and cleanup as they restore your property. Do You Need Mold Removal in Stafford? It’s generally a good idea to complete a mold inspection in Stafford after you experience water damage caused by a pipe burst, heavy rains, or a sewage backup. Mold thrives in damp, dark areas, which means flooded basements make great environments for mold to grow. 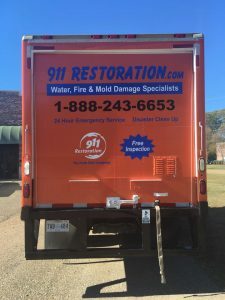 911 Restoration of Northern Virginia can take care of flood cleanup, water removal, and mold remediation after you experience water damage in Stafford. Let us remove odors associated with fungal growth with mold decontamination in Stafford. Thoroughly completing mold remediation can protect your property and your health in the aftermath of a flood. Handling water damage restoration and mold removal in Stafford with a professional company can quickly allow you to get your life back to normal. 911 Restoration of Northern Virginia can erase all signs of carpet water damage while restoring your home or business. Get steadfast service and a Fresh Start after a flood, pipe burst, or sewage backup by calling us now. Servicing the cities of Woodbridge, Stafford, Fredericksburg, King George, Dumfries, Triangle, Woodford, Quantico, Port Royal, Rappahannock Academy, Occoquan, Ashland, Prince William County, Stafford County, Aylett, Bowling Green, Crozier, Doswell, Glen Allen, Hanover, Henrico, Manakin Sabot, Mechanicsville, Midlothian, Milford, Richmond, Ruther Glen… and surrounding areas.